I’ve collected a few Jamie Oliver titles over the years; none of them get used very much. Jamie’s Kitchen horrified me with its egg-laden Baileys and Banana Bread and Butter Pudding. Jamie’s 15 Minute Meals and 30-Minute Meals demanded too much multitasking for me to really stuck into them. Still, I’m a sucker for budget cookbooks, so when I found a discounted copy of Save with Jamie, I had to have it. 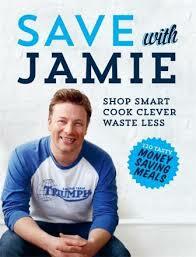 This time round, Jamie Oliver focuses on ‘delicious, exciting food that’s not hard on your wallet’. He’s also enlisted the aid of nutritionists, giving his recipes a transparency that’s sometimes missing from similar titles. Inspiration comes from around the world and though some meals miss the authenticity mark (‘okonomiyaki’ with tomato ketchup and yoghurt, wtf? ), at least it’s acknowledged (‘kinda Vietnamese salmon salad’ with apples and radishes anyone? )…In some ways, these kinda, sorta recipes allow for a relaxed cooking style where it’s okay to substitute, using the odds and ends rolling around the bottom of the fridge or whatever’s in season. I snuck all sorts of sad looking vegetables into a ‘happy frumpy minestrone’ with Oliver’s blessing. Over half of the meat recipes require leftovers from a roast, which fits in with the book’s waste not want not philosophy. Nevertheless, while putting together a mothership roast each Sunday is okay if you’re in a cool British climate, turning on an oven during the heat of an Australian summer is insanity. The book does go into other thrifty basics like jointing a chicken, using offal and weird offcuts, but I would have liked these sections beefed up a little bit more. Thankfully, Oliver offsets this lack with an extensive vegetarian section and a seafood chapter that doesn’t rely heavily on leftovers. Yep, don’t let its structured visuals fool you, Save with Jamie is a flexi-planned affair, making budget cooking fun in a ‘lugs of oil’ fashion. I just wish it had a dedicated thrifty dessert section instead of banging on a two-page spread on fruit as an afterthought.